Our Bible journaling has been a great success. Around 120 people at Wightman began the challenge to read through the gospel of John during the season of Lent. I have enjoyed the feedback of people who are reading an entire book of the Bible for the first time, of couples who are talking about Scripture at the breakfast table, of small groups that started and are going to continue to meet after finishing the gospel of John. At the beginning of Lent, I remarked that most of the people at Wightman are Bible “believers” but how many are Bible “readers?” Over the past six weeks, we have increased in the number of people who are reading Scripture, but just as John isn’t the end of the story, I hope with the coming of Easter we don’t stop reading the Bible or stop our Bible journaling. I have come up with another Bible reading plan for the book of Romans and it will be available at the church or on our website. Other reading plans will also be developed. 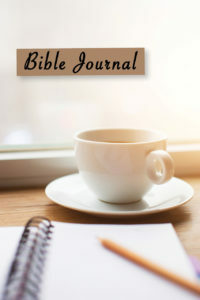 My hope is that our Bible reading and journaling is not just a one-time event and that it will become part of our ongoing spiritual development. I hope Wightman will become known as a congregation who knows the Bible. Thank you to all who have joined us in the challenge. I would love to hear your stories of how this journaling has enhanced your understanding of the Bible and impacted your life. Easter morning was not the end of the story, it was a new beginning. I hope as we continue past Easter, God will use His Word to create new beginnings at Wightman.